Good news! The world is better off. For the first time ever, the number of people living in extreme poverty is set to fall to below 10% of the global population in 2015, the World Bank said. "This is the best story in the world today -- these projections show us that we are the first generation in human history that can end extreme poverty," Jim Yong Kim, World Bank's president, said. The World Bank projects that the number of people living in poverty fell to 702 million people in 2015, or about 9.6% of the global population. That compares to 2012, when 902 million people lived below the poverty line, which was around 12.8% of the population at the time. The organization defines living in poverty as anything less than $1.90 a day. Global poverty rates are improving thanks to investments in education, health, and social safety nets that help keep people from falling back into poverty, the bank said in a report. Kim said the world is moving closer to the "historic goal of ending extreme poverty by 2030." But Kim also stressed that slowing global economic growth is now making the goal a "highly ambitious target." The bank has warned the progress is still too uneven, with some regions lagging behind. Sub-Saharan Africa remains the global poverty hotspot, with roughly a half of the global poor living in the region. 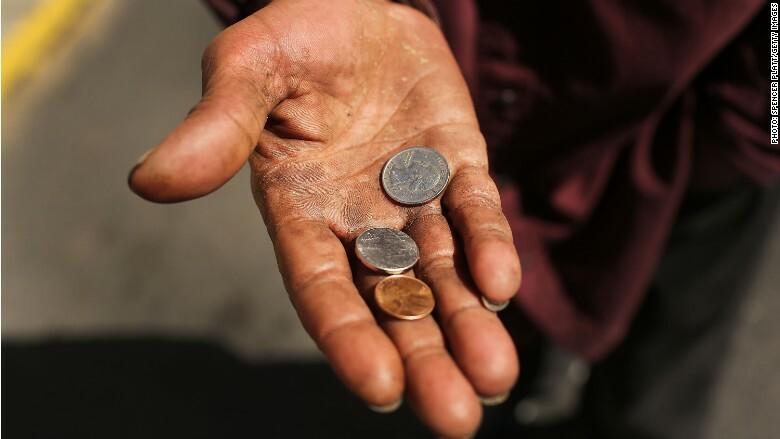 Poverty rates in the region declined more slowly than elsewhere, falling from an estimated 56 percent in 1990 to a projected 35 percent in 2015. The bank said that reducing poverty in the East Asia and the Pacific regions has been crucial to the global progress. The 2015 numbers are only projections, because of the delay in getting accurate poverty data from the world's least developed countries. The report said poverty is becoming more entrenched in countries that are either conflict ridden or too dependent on commodity exports. "There is some turbulence ahead," said World Bank chief economist Kaushik Basu. "The economic growth outlook is less impressive for emerging economies in the near future, which will create new challenges in the fight to end poverty and attend to the needs of the vulnerable, especially those living at the bottom 40 percent of their societies," he added.